Classic Menu Indicator 0.09 was released recently with more languages support and now it use unity-lens-applications.menu for Ubuntu Unity. 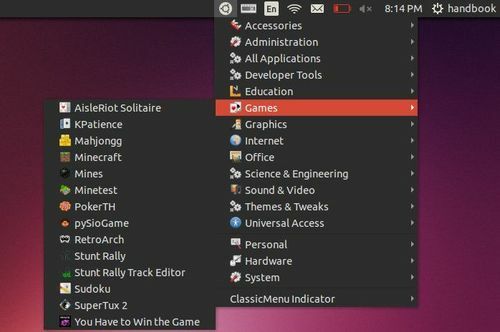 As you may know, ClassicMenu Indicator is a notification area applet (application indicator) for the top panel of Ubuntu’s Unity desktop environment. It provides a simple way to get a classic GNOME-style application menu for those who prefer this over the Unity dash menu. Like the classic GNOME menu, it includes Wine games and applications if you have those installed. Download & install the DEB or build the source tarball: official download page.